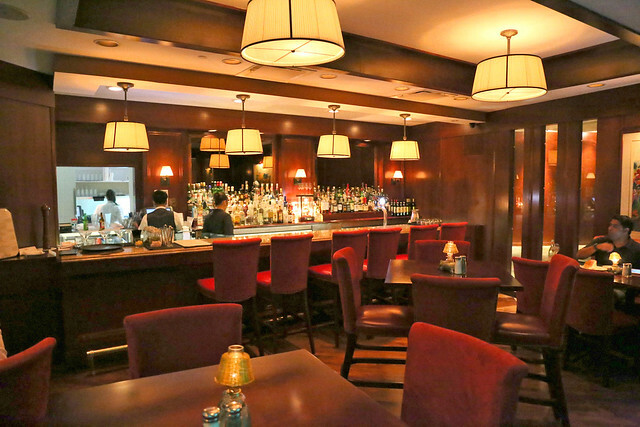 Morton's is still the steakhouse to beat; Plus happy hours now daily! Steakhouses - we sure have seen quite a few of them popping up in Singapore in the past couple of years - CUT, Wooloomooloo, Ruth's Chris, plus other restaurants also offering steaks and grills. Oh, it's nice to be spoilt for choice. 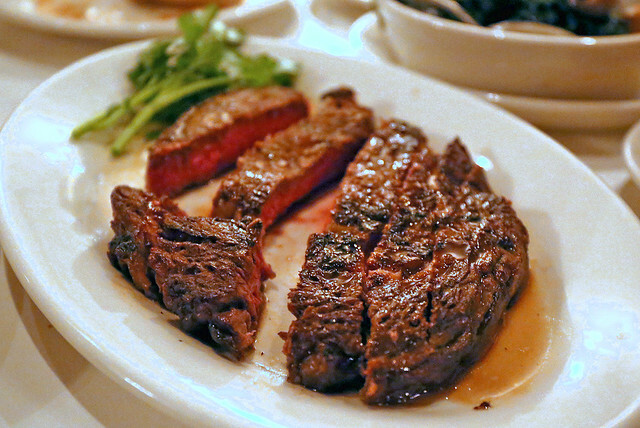 And some of these places have seriously pushed up the bar for good steak. Still, where do you go for the best steak in Singapore? 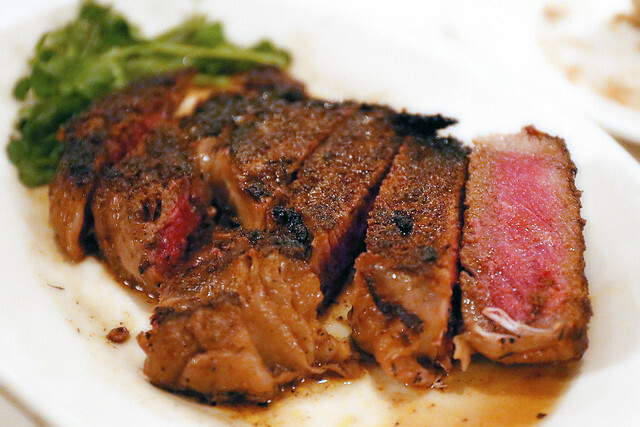 Well, I've been trying more than a few places, but reserved my opinion until I took on the granddaddy of steakhouses in Singapore - Morton's at the Mandarin Oriental. But wait. I'm getting ahead of myself. Let's start with the famous MORTini Nights - probably the best happy hours in town! 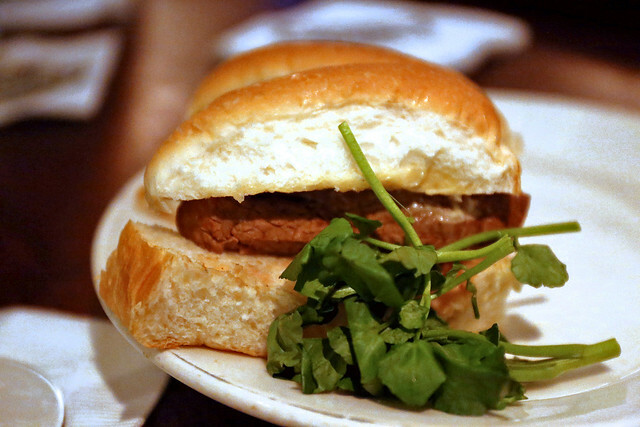 For just S$14.95, you get a full-sized martini and free-flow filet mignon sandwiches! And it's now on every day, 5pm to 7pm! Happy hours just got happier! This is the Lycheetini. It's pretty strong, for me, anyway - I'm an alcoholic wuss! The famous complimentary sandwiches that everyone grabs. I am not a fan of filet mignon, so these were just okay for me. These are nothing, NOTHING(!!) like the steaks you will get inside. 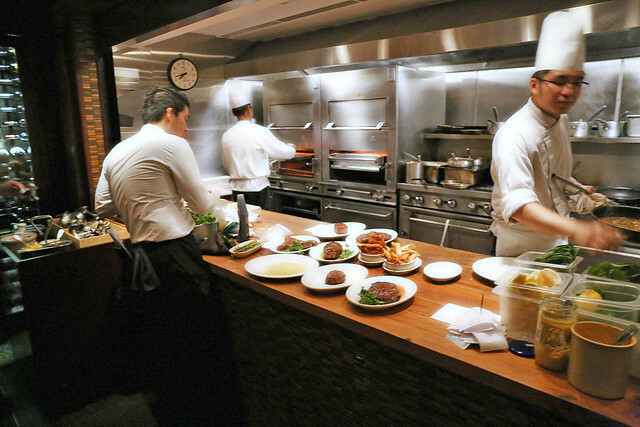 The kitchen at Morton's - they are busy! You'll see them just after the bar (first photo). 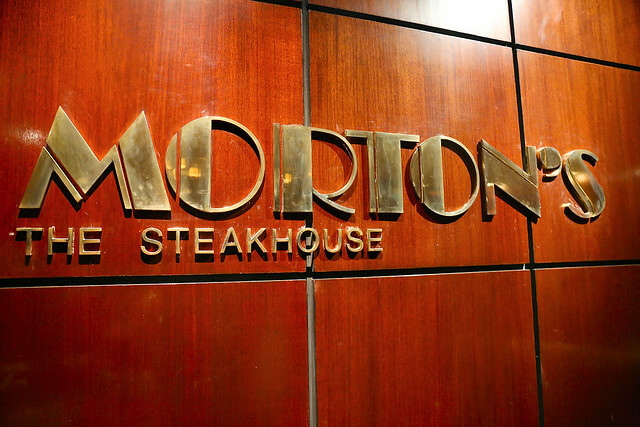 Morton's use their own special griller that sears the meats at 800-1000 degrees Fahrenheit. Seven to eight minutes is all it takes to broil most cuts. Only the double porterhouse takes 20 minutes. The famous Onion Loaf! It's huge, it's delicious - we finished it all! Yes, I came with Leroy, and we both love bread, so this was short work. 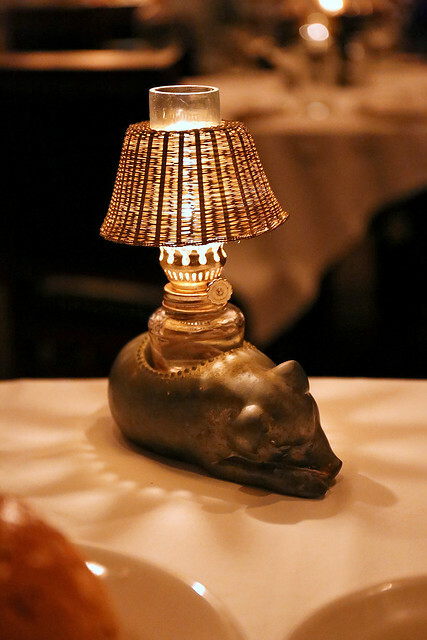 I don't know why but I just love this little pig lamp. Must be the aura of contentment. This is very smooth and one of the more delicate-tasting ones around. It's rich without being too overpowering. 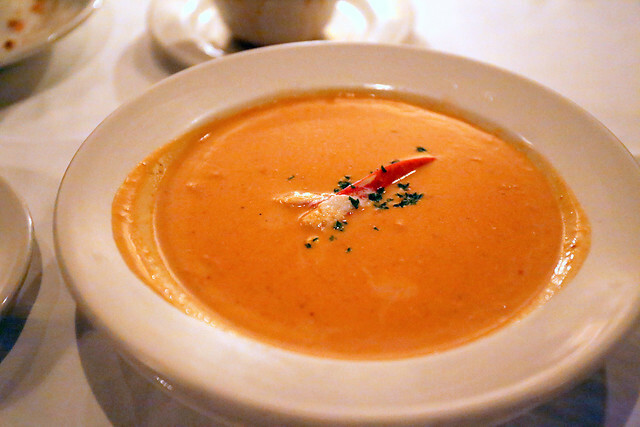 Personally though, I prefer a bisque that's bolder and sharper (even if it's more rustic). This is a half-portion for tasting purposes, but I felt that it was actually just right, as too much will just fill you up prematurely. 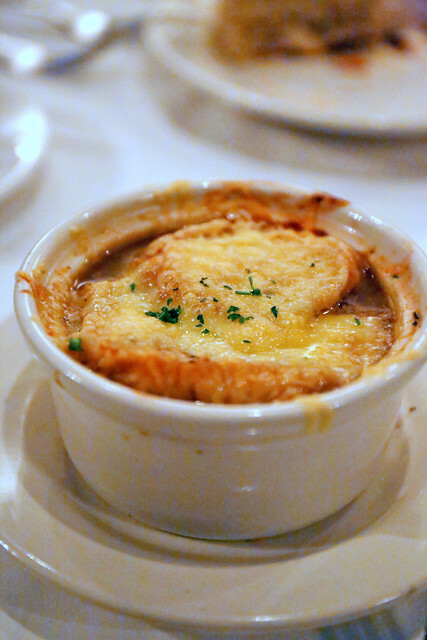 This potent concoction is crusted with Swiss cheese - addictive and savoury to the last drop. Morton's also serves some pretty decent seafood. 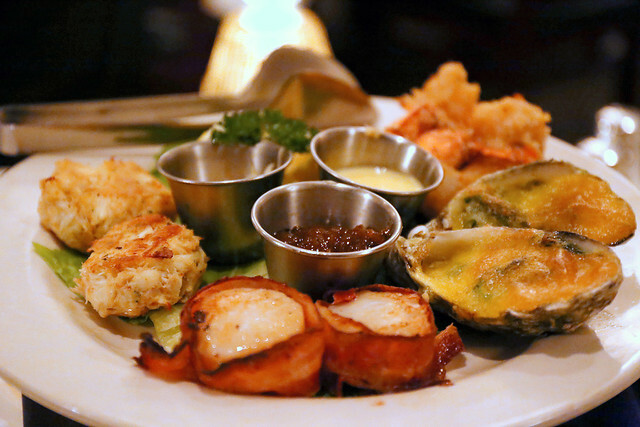 In this decadent platter, you'll get a sampling of some appetisers: Sea scallops wrapped in Bacon, Jumbo Lump Crab Cakes, Oysters Rockefeller, Jumbo Shrimp Alexander. A good way to try a little bit of everything. There's also a chilled seafood version with Maine lobster, Jumbo Shrimp Cocktail, Jumbo Lump Crabmeat, Oysters on the Half-Shell, Alaskan King Crab Legs. Oh man, we had difficulty choosing! 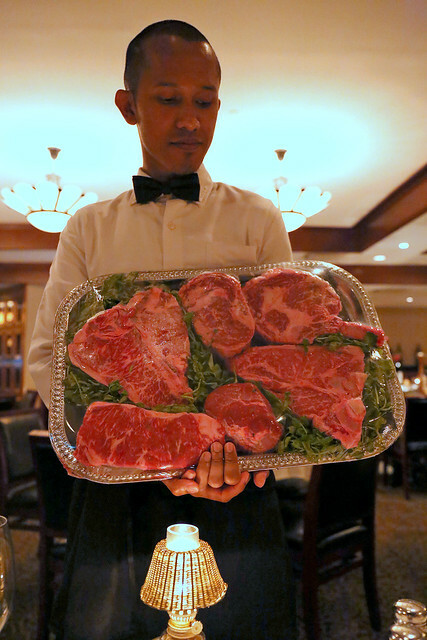 Of course, the Morton's experience is not complete without the steak cuts show-and-tell. A waiter will briefly explain the different selections available. The porterhouse and double porterhouse are both aged beef from Australia (yes, drats to the bone-in US beef ban that's still in place). 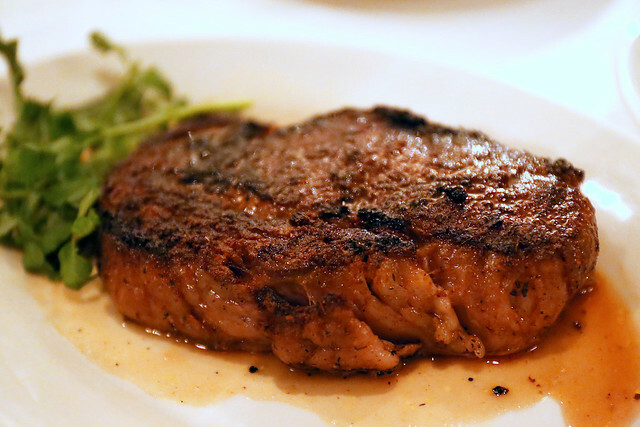 USDA Prime beef selections include center cut ribeye, center cut filet mignon, signature cut New York strip. They also have boneless prime rib on Fridays and Saturdays. 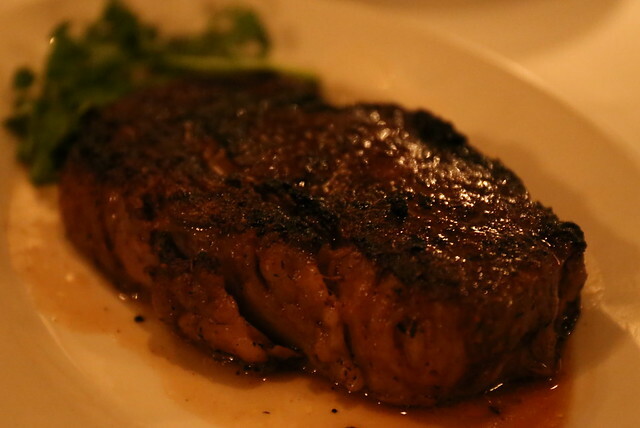 The very sublime Center Cut Prime Ribeye (16oz or 464g; S$99.50), also pictured upfront. I'm showing you this unedited photo to demonstrate the lighting you get at Morton's. As many of you may know, the ambiance there is wonderfully romantic. But a total nightmare challenge for food photography. So my apologies for photos that look off or grainy. If not for the Canon 6D which has high ISO capabilities, I'd never be able to take anything (certainly not with my old 400D). The next time I go, I'll be happy to leave the camera at home. Oh who am I kidding? 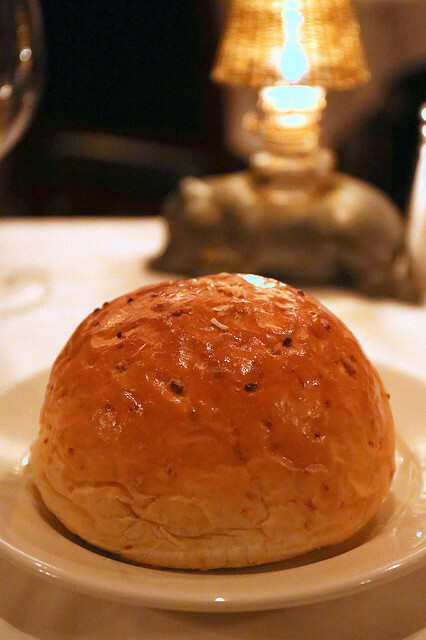 Every meal at Morton's is worth capturing and remembering! Here's the medium-rare ribeye all sliced up. Every bite of this tender well-marbled meat is a chorus of joy. The perfectly caramelised exterior adds aromatic contrast with the juicy center. The beef is wet-aged about 3-4 weeks (longer than most places) and while it's from grain-fed cattle, you still get a nice balance of beefy flavours along with the fat. Also very popular is the ribeye marinated with Morton's special Cajun spices for 60 hours. This steak tends to be a bit more charred because of the spice mix on the outside. The spices certainly lent a more complex flavour experience, but ultimately we both preferred the unadulterated flavours of the regular ribeye. 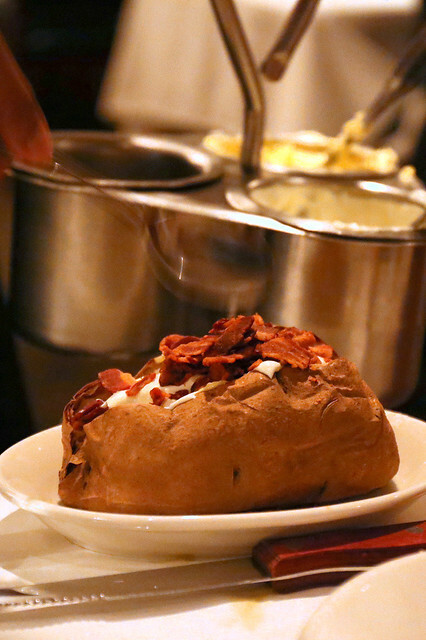 Oh the many ways to enjoy potatoes - they are all here at Morton's. Baked, mashed, Lyonnaise, hashed brown, steak frites, and even in a bacon & onion macaroni and cheese. Other side dishes (S$22) include jumbo asparagus (steamed or grilled), creamed spinach, brussels sprouts, onion rings with Thai cream sauce, and sauteed button mushrooms. Morton's also has an excellent sommelier who can deftly recommend wine pairings for your meal. Of course, you can also pick spirits, beers and cocktails if you prefer. Speaking of their staff, the service here is lovely. Warm, welcoming and not pretentious. More importantly, they know their stuff. This is the dessert tray showing you choices for the night. 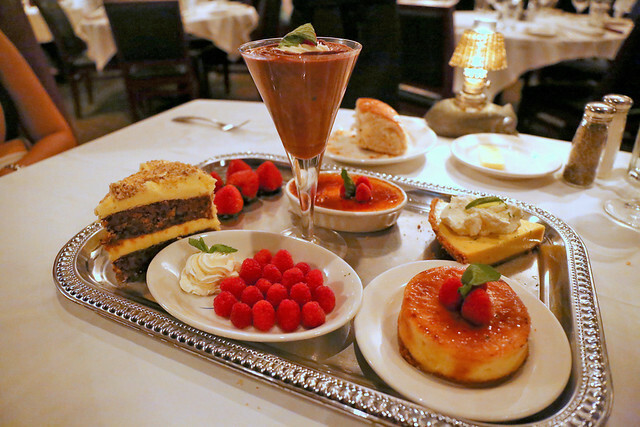 Will you pick the double chocolate mousse, seasonal berries with sabayon sauce, creme brulee, or souffle for two? We chose something a bit different and were rewarded with a gorgeously rich yet tangy treat. It's intense, but not too sour. 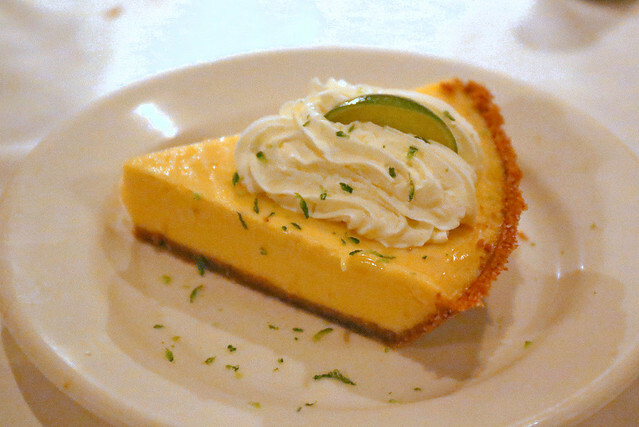 I normally do not like sour desserts, but this was pretty good. 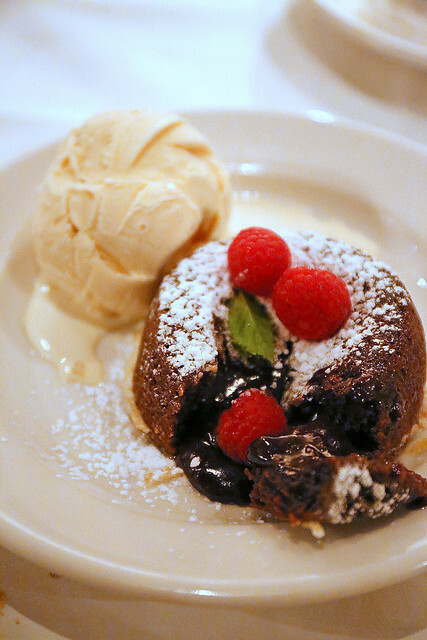 Of course, you can't walk away without trying their most famous and possibly most decadent dessert. Oh scrumptious chocolate. Yes, the molten centre sort of flowed when we cut into it, but not a lot. So don't wait too long to cut into it! Morton's has 63 outlets in the United States, but only six internationally - Mexico City, Toronto, Singapore, Hong Kong, Macau and Shanghai. They've made their name providing epic portions of good food with excellent service, and I hope they continue to do so. It truly is an enjoyable dining experience. Right now, the restaurant still sports the 1920s vibe with dark woods and subdued lighting, but there is talk of the place adopting a more contemporary design next year (with the change in direction by Landry's, Inc acquisition of the chain). So if you like the classic look, go while you still can. I'll certainly be back for more ribeye. Many thanks to Morton's for the invitation, and to GHC Asia for hosting the memorable dinner. wow, did you use lighting? It was too dark in the restaurant for my camera! No, I didn't. This is all digital enhancement! But I have to say the camera did very well in low light conditions! I couldn't catch anything on the iPhone. Too dark.